What is an Opo Squash? Opo is an Asian squash similar to a zucchini with a very mild flavor. It is from the gourd family and is native to the cuisines of China and Southeast Asia. Also known as Bottle Gourd, it symbolizes good health in Chinese tradition. Prepare as you would zucchini or other soft-shelled squash. Add to soups or stir-frys. Dim sum restaurants steam opo, then stuff with a shrimp or pork filling and serve cut into rounds. 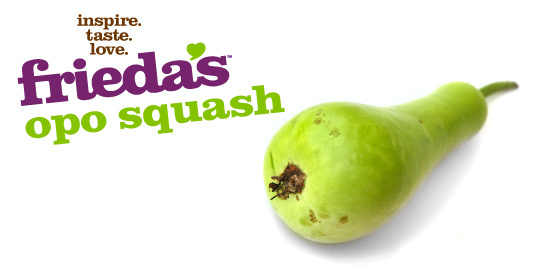 Choose firm squash that has evenly-textured skin, free of wrinkles. Year-round; limited distribution in the U.S. Product of Dominican Republic, Honduras, Mexico, and U.S.A.